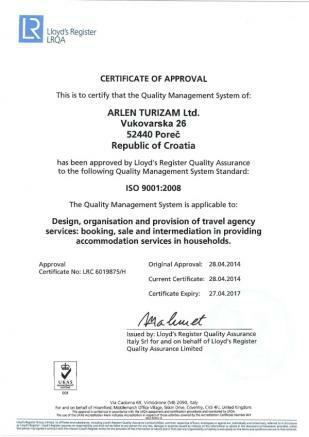 Management of Agency Arlen to this Policy quality opts for the development and implementation of quality management system in accordance with ISO 9001: 2008. The agency is obliged to provide to their employees, partners and customers a high level of service quality and systematically introduce improvements in their business processes to the satisfaction of all users. Quality policy is in line with its mission, vision, strategy and objectives of quality with what is familiar to all employees of the Agency. The agency takes care of its employees through continuous training at seminars, regular testing customer satisfaction, and other stakeholders, the Agency develops and promotes long-term partnerships. The Agency is committed to the principles of quality by the principles of sustainability and corporate social responsibility.